Mayor Bill de Blasio gave another press update on yesterday’s East Harlem buildings collapse at 116th Street and Park Avenue on Thursday afternoon. Assuring everyone that there are still many unknowns in terms of missing people as well as possible causes of the explosion, the mayor assured that the victims can take solace in the fact that the first response team has expanded every effort. “There are still things we don’t know … The response by fire department has been extraordinary,” he said. “The city is no stranger to adversity” de Blasio added. The rescue operations are still undergoing. 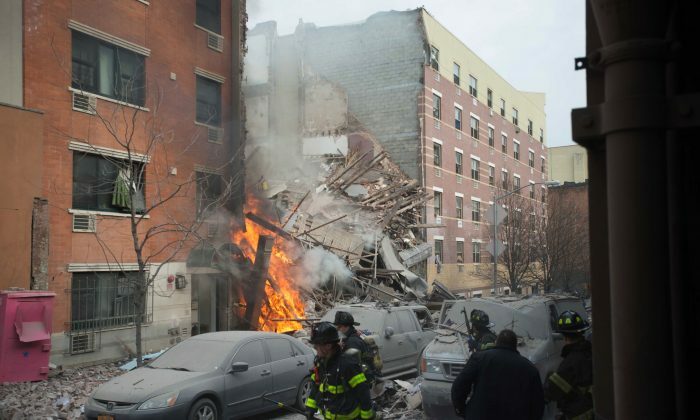 Fire Commissioner Sal Cassano said the FDNY will look into the main reason for the explosion, but first they need to find all the missing people. “Mainly we have to get rid of the debris first,” he said. Two name of those who died have been released. The names of the other five people who have been confirmed dead will be release after families confirm their identity. Another 40 people have been treated in numerous city hospitals. There were no injuries among the first responders. The call center at 311 has received over 200 calls so far, people were looking for those missing through the unified victim identification system. De Blasio urged anyone smelling a possible leak of gas to call in to ConEd or to call 311. The mayor also working with city agencies to improve the broader infrastructure problem. “We know this is a fundamental issue,” de Blasio said about the aging infrastructure. This is an ongoing story, check back for updates.